Many people have a very low tolerance level for any sort of creepy crawly in the house. 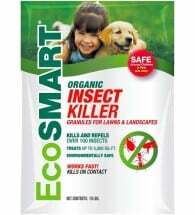 Here’s how to get rid of spiders FAST using organic and natural control techniques. Some 30,000 species of spiders occur throughout the world. They have eight legs and two body segments. 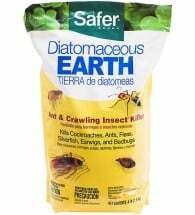 For the most part, they are considered to be beneficial because they feed primarily on insects and other spiders. At times they become a nuisance by finding their way inside your house. This typically occurs in the early fall when cooler temperatures force them to seek shelter. 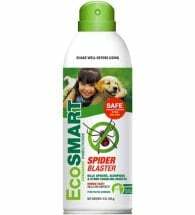 Read on to learn our 10 step treatment program for getting rid of spiders naturally and save BIG money doing it yourself! Almost all spiders are harmless and usually remain hidden. They do not seek out and bite humans. In fact, most cannot penetrate our skin with their fangs. A few are considered venomous to humans and care must be taken to avoid being bitten. Black Widow (Latrodectus spp.) – Adults have shiny black bodies (9/16 inch long) with a distinctive red or red-orange shaped hourglass pattern on the underside of the abdomen. They are not aggressive and often found in dark, undisturbed areas including window wells, crawl spaces, corners of garages, and old rodent burrows. Their bite is rarely fatal. Brown Recluse (Loxoceles reclusa) – Pale brown or buckskin colored, these venomous spiders (1/3 inch long) have long, dark brown legs and a violin shaped darker marking on the top of the body near the head. They are not aggressive and live within a loose web in dark corners of buildings. Their bite is painful, often leaving an ulcerous wound, but is rarely fatal. Hobo (Tegenaria agrestis) – Originally from Europe, hobo spiders ended up in Seattle, Washington sometime before the 1930’s. Since then they have slowly expanded throughout the Northwestern United States and Western Canada. Adults (1/4 inch long) are brown in color and have a chevron pattern on their abdomen. 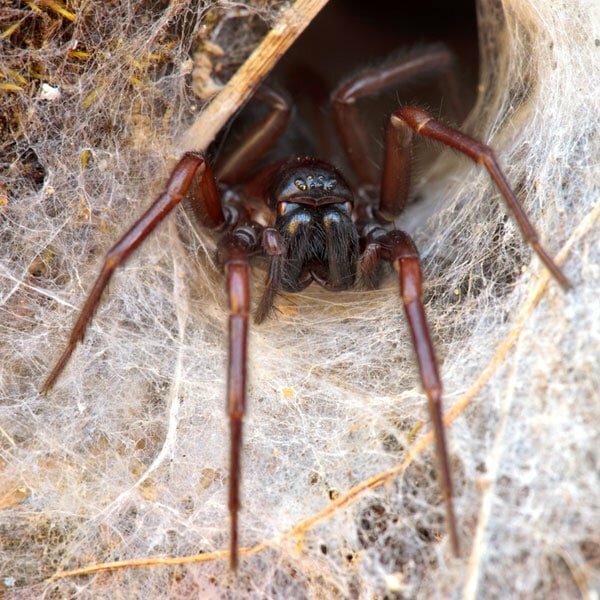 They live in a funnel web and are often found between bricks, in crawl spaces, around out buildings, and under wood. More aggressive than most, their bite is similar to that of the brown recluse and is rarely fatal. 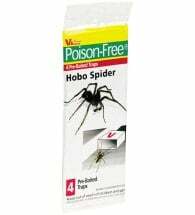 There are a large number of non-poisonous spiders across North America that are similar in description to the hobo. As a result, many other species should be suspected before even considering the hobo spider as a possibility. The life-cycle varies greatly depending upon species. In most cases, females reproduce by laying eggs in a silken egg sac. The egg sac is either carried around or hidden in the web. Tiny, newly hatched spiders emerge 2-3 weeks later. Most mature to adults in about one year. Several species live 1-2 seasons, but the females of a few species may live 5-20 years. Males and females live separately and only come together to mate. Clean up and dispose of trash, debris, old equipment, etc. Repair screens and maintain the weather-stripping around doors and windows. 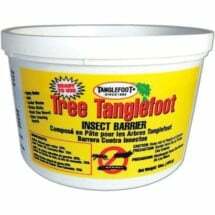 Apply Tanglefoot Pest Barrier to incoming pipes and door jambs to intercept home invaders. Inside the house, spiders and their webs can be eliminated by using a broom or vacuum cleaner. 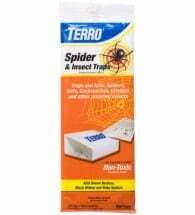 Crawling insect traps placed into tight corners will capture many crawling pests. 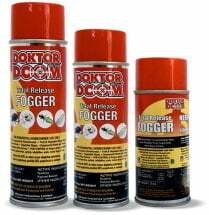 For larger areas and crawl spaces consider using Doktor Doom Foggers. Made with natural pyrethrum, they provide fast re-entry times with NO long-lasting odors. NO chemical toxins! 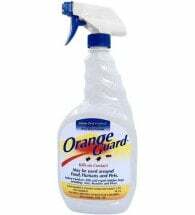 This non-drying, sticky "glue" provides protection all season long.